It's a rather less interesting question, and more difficult to answer, since you have obliterated the minutes values. I have seen a meridian marker only vaguely similar. It is in the NGS database and the geocaching datasheet for it is here. I realize this is no answer to your question, however. It's vaguely possible that such meridian stones were monumented by a decree of the local municipality. By the way, I calculated the location in degrees, assuming that the 07 and 58 numbers are decimal seconds. The result is 111.837242 and 40.754883 and the geocaching map of this location is here, if it helps anyone. I can't make out the date on the plaque, which seems to be unrelated to the original function of the stone. I'd suggest you research the subject of the plaque. To figure out the location of the coordinates you first have to decide what system they are in. Obviously something that age isn't in the systems we usually set our GPS to. Various earth models have been used over the years. These might actually be correct astronomical coordinates fit to some older model. Maybe even spherical earth model, or if new enough then the Clarke ellipsoid. I'm not expert enough to calculate it, but I think 0.3 mile would be a possible difference between spherical earth and NAD83 or WGS84. I know that even between NAD27 and NAD83 many parts of the country can have on the order of 100 ft difference and those are both based on ellipsoid models. You don't give the coordinates (and datum) for where you found it. If the 0.3 mile is mostly north-south, then that would particularly indicate that we need an earth model conversion. Things do sink, or new dirt accumulates from vegetable matter, and landscaping sometimes changes the level of the ground. So I would not take the partially buried look to be evidence that it was moved. Thank you - I believe the 07 and 58 are in fact decimal seconds, but it's just a hunch. Using that, I'd gotten a slightly different answer for the location - I think I need some help on how to do coordinate conversions. How did you do your calculation? My GPSr read N 40deg 45.904', W 111deg 50.002' on the monument, so about 0.111' error in north-south and 0.232' east-west (if I did the min/sec to min/decimal conversions right). The memorial plaque on top of it is dated 1946, so I've assumed their measurement was no newer than NAD27. I've researched the plaque a bit online, but haven't found anything about the coordinates on it. There's a museum nearby, and I plan to go ask about it there. There are numerous biographical references to "Vinegar Joe" Stilwell on the web but I didn't quickly find any connection to Fort Douglas or Salt Lake City. You might want to check out why he is indexed in the Utah Historical Quarterly 48: 201. 40 45' 47.58" 111 50' 14.07"
a shift of 65.114 (meters) or about 214 ft, mostly in longitude. So that would not explain the discrepancy. Also, on further consideration, I don't think anything to do with a spherical model is going to explain a southwesterly shift of that size. Yes, I retrieved my paper from the recycle bin and saw 40 45 17 58. I hadn't maximized the picture window properly. It could be a lot of things, but remember that meridians established for survey or boundary purposes in the mid 1800's would have been established by complex and difficult astronomical observations. One thing is that they would not be based on NAD83 datum that your GPS is. Also somewhat difficult to be precise due to uncertainties of time (remember the famous longitude problem), and limitations in instrumentation available at the time being mechanical theodolites that often had to be transported into the frontier and would not be observatory quality. There are many examples of such lines, and they will all be off, particularly E-W from a modern GPS position. It could also be a meridian stone used to set or calibrate or test compass' or other equipment. I think the plack on top is probably un related. One more thought on the four sets of numbers. Instead of the last set of digits being decimal seconds, is it possible that they represent 1/60th of a second? A minute is 1/60th of a degree, and a second is 1/60th of a minute. Why not subdivide seconds into 60 sub-units? I can't say I've ever heard of such a thing. On the other hand, the author of the inscription certainly had to know how to use the decimal point and would have been perfectly capable of writing 14.07" instead of 14"07. In the unlikely event I am right, the inscription would correspond to Long 111º 50' 14.12", Lat 40º 45' 17.76"
I measure the distance from these coordinates to the ones on SamWibatt's GPSr as about 0.7 miles. Whether the final set of digits represents hundredths or sixtieths of a second, if I've entered them into Google Earth correctly, the original location appears to be in a parking lot, which might explain why the stone was moved. You don't say what the nearby museum is. They might or might not be helpful. Other sources of possible help are the Utah Council of Land Surveyors, the Utah State Historical Society, local public library, or university geography department. While NOT anything like knowing much about benchmarks, this is a fascinating stone. I did find that Stilwell Field had to be dedicated after Stilwell was a General, which means later than 1934. Obviously the two are not related. I too found the coordinates to be in a present-day parking lot; I'm going to go see if there's anything other than bare pavement at them. I expect not, but there may be some other sign nearby of a former monument or something. The museum nearby is a Fort Douglas military-historical museum; they'd certainly know about any connection Gen. Stilwell had to the fort, and possibly about any military surveying that was done in the area. The fort didn't exist until 1862, so the marker wouldn't be any older than that. (AFAIK, the area where the marker seems likely to have been moved from, if it were moved, was under the fort's control and had no other use before that; if the Mormon settlers had done any surveying they wouldn't have called it a U.S. marker, I'm guessing). I did talk to one former Geography graduate student at the University, who is now a coworker of mine. He didn't know anything about the marker, and said it was just the sort of thing he'd have been interested to know about when he was in that field. He may know people who do know about it, though. on edit: It's looking clear to me that whatever this thing is, it isn't a loggable benchmark here on Geocaching. Should I set up something on Waymarking.com about it? If so, what category? Old stones like this can fall into several categories. One type is a monument giving a specific Latitude or Longitude, such as this one in Raleigh, NC, set in 1853. The Federal Government published books for each state, telling where they placed the markers in various counties. Unfortunately, the descriptions are vague ("near the old county home"). The NC Geodetic Survey recently asked for assistance in locating these old marks. GEOCAC volunteers have found the stones in 20 counties, and professional surveyors have found another three sets. Glancing through the photo gallery, I've noticed similar stones being recovered in other states, as well. Just a note on how much geographic coordinates varied prior to the establishment of national datums. The Salt Lake Merdian and Base Line was originally surveyed by Pratt in 1847 when he established the grid for plats. He used astronomical techniques for both the latitude and longitude, and arrived at 40° 45' 44" N, 111° 26' 34" W.
In 1869, George Dean, reporting to the Coastal Survey, made new astronomical observations and arrived at 40° 46' 2" N, 111° 53' 30" W.
The monument that stands marking the spot today is at 40° 46' 10.2" N, 111° 53' 28.7" W (NAD83) according to 1-foot resolution aerial DOQ photographs available online. The geocachers who have stood at the monument and recorded their GPS coordinates have gotten 40° 46' 9.4" N, 111° 53' 29.2" W, in good agreement with the aerial photos. Note that that is in total disagreement with the bronze plaque that is at the location proclaiming it to be at 40° 46' 04" N, 111° 54' 00" W. The moral is don't trust bronze plaques. The monument at the Army field looks old enough to have been surveyed prior to 1901, which was the date of the first national datum, the US Standard of 1901. Prior to that time, most surveying and mapping used local astronomical datums. However, I don't think that any surveyor of the 19th century would have been bold enough to suppose that he could determine latitude and longitude to 1/100 of a second, or even 1/60 of a second if that's what it is. What's curious about that monument is that it appears to be a standard monument of some kind. Note the dashed lines below the latitude and longitude numbers. It's as if it were mass produced with "fill in the blank" for the numbers. Thanks - these things had occurred to me, too; the number of "significant figures" in the coordinates showed some confidence in the measurement, and the inscription has, as you say, a typeset or mass-produced look. Given that, I thought these monuments might be more common than they apparently are. This article seems to describe and picture a similar stone. I'll bet if we could dig down a little furtherby the face that says US Meridian it would match this picture. I've sent the organization that put out the article an email inviting them to join this discussion. Here's a mention of Wheeler. And a collection that includes documents from Wheeler. It appears that Wheeler's original notes are at the University of Nevado, Reno, in case any serious historian wants to do more research. Bill93 - Terrific find. Thank you very much! On edit: Multiple terrific finds. Thank you even more! If by chance it is the same Wheeler. This is one of his astronomic stations in New Mexico. RECOVERY NOTE BY US GEOLOGICAL SURVEY 1945 STATION MARK--A BRONZE USC AND GS STATION DISK, STAMPED ---FORT BAYARD USGS 1945---. NOTE--REFERENCE MARK NO. 2 OF THE U.S. COAST AND GEODETIC SURVEY IS A STANDARD USGS ALUMINUM TABLET, SET IN A SQUARE GRANITE STONE, WHICH PROJECTS 1-1/2 FT. ABOVE THE GROUND. THIS MARK IS IDENTICAL WITH THE 1879 WHEELER ASTRONOMIC STATION AND WAS THE MARK USED BY USGS IN 1931 AS STATION ---BAYARD---. Found some more on Wheeler. I got beat to this one. Wow, thanks again to you all for digging up the info on Wheeler. I went by the University of Utah library and poked around a bit. I found, in the 1966 Utah Historical Quarterly, a set of letters from one of the survey team's astronomers; also, a book of some photographs from the expedition. Both of these were from before Wheeler's turn through the Salt Lake City area, so I haven't yet found anything about this particular marker or the team's adventures in the region. There was also a book about Lt./Capt. Wheeler himself, which didn't go into much detail about what the team did. It sounds like Wheeler was something of a jerk and attention whore, but his expedition did some good work. It's all been a very interesting little bit of research, and I appreciate your help. I will keep looking into it and post if I find anything about this monument. If anyone notices info in the various sources that will let us compare Wheeler's coordinates with present coordinates, be sure to point that out here. It seems likely the stone got moved, but we don't have any proof yet. As holo pointed out most surveyors of the time wouldn't claim 2 decimals on the seconds. I think it said it took a month's work for Wheeler's team to refine their measurements. I wish there was a readable but not oversimplifed explanation of how they went about it. One other tidbit - this leg of the Virtual Tour of Fort Douglas shows the marker in the foreground of the second picture in the Stilwell Field section. Doesn't say anything about it, though. The site is an interesting one if you're inclined toward military history. The fort is now mostly turned over to civilian use (notably used for athletes' housing during the 2002 Winter Olympics). 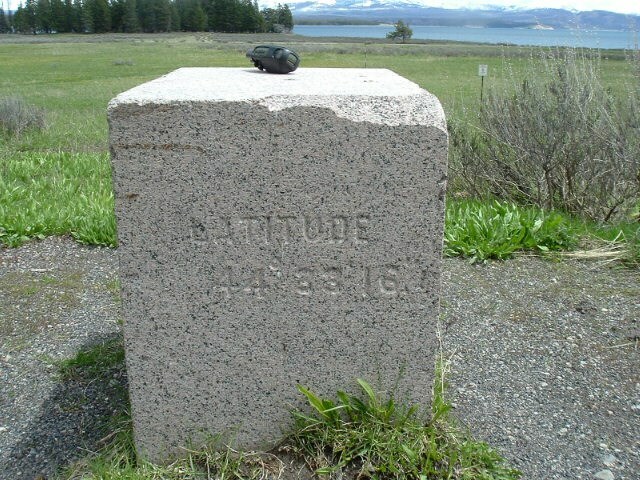 Now this is what I call a meridian marker! Another idea: since the former Fort Douglas is now part of the University of Utah, perhaps the University physical plant/buildings & grounds people might have some information. Specifically, they may have some information about whether the monument was moved to its current location, and if so, from where. That is for sure a prime meridian marker, heh heh heh. There are a few other goodies of that kind here. Re: physical plant people knowing about the Fort Douglas marker being moved, it's possible. I'm guessing it was moved 60 years ago or more, but there may be legends. This may be a clue to the Math that was used during that time period. Ok, I'm changing my mind. I doubt the stone was moved. Someone who undertands the conversion from astronomical coordinates to geodetic coordinates needs to check this because I'm way out on the technical limb past where I'm comfortable. Now we're talking a discrepancy of 142 feet, not tenths of a mile. How accurate were the GPS readings indicated to be, and which datum do you have it set to? Ok, I'm changing my mind. I doubt the stone was moved. ...Now we're talking a discrepancy of 142 feet, not tenths of a mile. AFAIK the datum was WGS84; I'm running a Garmin eMap with old firmware (2.04) and it doesn't seem to allow any datum selection. My GPSr reported an accuracy of 16.4 feet. IIRC the "accuracy" measurement is some sort of user-friendly, non-standard Garmin thing, so I'm not sure exactly what it means. I should also mention that I've only taken one reading there, and it sounds like for best results I should take a few and combine them. As I inferred the other day, there is no reason to believe that the monument has been moved, the coordinates are just in another system. BTW the format is common the seconds symbol being used in lieu of the decimal point for decimal seconds. I have seen it many times. So how to convert from NAD83 coordinates to 1880's era astronomic coordinates is a good question. First, the earlier datums specifically NAD27 is inherently closer to astronomic because the model is closer to the actual earth shape for North America. NAD83, is based on a world best fit ellipsoid. Anyway I think that either can be converted back since the gravity components are now readily available. I would have to revisit some NGS publications to get the form to use, and then use the deflec programs. They are available on the NGS website and there is probably an online interactive version also. If I give it a try I can try to outline what I come up with later this weekend. If the station is pure astronomic position, then it will have some inherent error due to the imprecision of the time and instrumentation used. I was delighted that Bill93 alerted me about this forum. I am a retired hydrogeologist, but now as a local historian I have been researching the activities of Lt. Wheeler in Colorado, in particular the installation of six survey markers in this state by his astronomic teams in 1873-74. One of them is in my town of Georgetown, and it was this marker that I wrote about in our Historic Georgetown, Inc., newsletter, which Bill93 provided for the readers of this forum. Wheeler’s final report consists of 7 volumes, which he published over a span of 1875-89. Volume II, published in 1877, is subtitled “Astronomy and Barometric Hypsometry.” In that volume he presents the data that were used to compute longitude and latitude of 19 sites in Colorado, Utah, Nevada, Wyoming, New Mexico, Montana, and Nebraska, through 1874. Each of these stations was connected by telegraph to a receiving station at either Salt Lake City or Ogden, Utah. Hourly readings of stars were taken at both the sending station and the receiving station. I am not qualified to discern if the information and descriptions are sufficient to determine the methods that were used to compute longitude and latitude from these data, but perhaps others can evaluate this. I visited each of the six sites in Colorado where a monument was installed and made a concerted effort to locate the monuments. I found three, in Georgetown, Julesburg, and Trinidad. At the other three sites (Labran, now Florence; Hughes, now Brighton; and Colorado Springs), the markers have been destroyed or moved. Wheeler states that during 1872-74, all monuments used as observing piers were of granite or sandstone, although the stone at Las Vegas, NM, is described as being made of limestone. According to the report, “Lately” (1875-77?) the piers “were made of brick with a stone cap for observing purposes.” The dimensions of the Georgetown monument are about 3.5 feet high and 2.0 x 1.5 feet in cross section. The Wheeler team did not install a monument in Salt Lake City, at least not through 1874. Instead, they used the Mormon observatory, located “about one hundred feet from the southeast corner” of Temple Square. The observatory consisted of a double house, one inside the other. The inner frame structure was built by the “U.S. Coast Survey;” the outer one, of adobe material, was built by the Mormons. In the observing room were “two stone pillars” consisting of “solid blocks of sandstone,” which were used as their platforms for their instruments. Does this observatory still stand? I was interested that in the first post of this forum, Sam Wibatt states that the marker that he observes in Salt Lake City is made of concrete (could it be limestone or sandstone?). Perhaps it is a “concrete cap,” equivalent to a “stone cap,” that might have been used at a later date. I am unaware of any Wheeler reports that give data for monuments installed after 1874. Wheeler in his 1877 report describes the standard inscriptions that were cut on the north and south faces of the monuments. These are similar to the inscriptions described in this forum for Wibatt’s SLC monument. On the north face: U.S. MERIDIAN AND LATITUDE MARK, EXPLORATIONS WEST OF THE 100TH MERIDIAN, WAR DEPARTMENT. On the south face: LONG., LAT., ALT., U.S. ENGINEERS, 1873. On the Georgetown monument, the terms “LONG.” and “LAT.” are followed by blank stone. Evidently the stone was inscribed before being shipped to the site, with the expectation that the longitude and latitude might be filled in later. Also on the Georgetown marker, there is no word “ALTITUDE,’ and on the south face it reads “71 [?] LOCATIONS WEST OF THE 100TH MERIDIAN. (The number 71 is not clear.) If anyone knows what the “71 locations” refers to, I would appreciate learning that. In his report, Wheeler very specifically gives coordinate values to the nearest 0.01 second. He includes the decimal point. For example, the coordinates for the Georgetown monument are listed as “Longitude, 105° 01’ 27”.64 ± 0”.05 west from Greenwich” and “Latitude, 39° 42’ 36”.36 ± 0”.06 north.” In the summary table of geographical positions, coordinates are listed for “Salt Lake City, Utah” obtained from a “Coast-Survey determination.” Presumably the values are for the above-mentioned Mormon observatory. The coordinates are listed as 111 53 42.90 and 40 46 03.76. These values do not agree with the original values given by Sam Wibatt for his monument in post #6, so I assume that his monument is not at the observatory site. I have computed the coordinates of the Georgetown monument from two sources. The position of the monument is actually shown and labeled (“Astronomic monument”) on the USGS Georgetown, CO, topo quad. On my National Geographic CD-ROM of Colorado topography, this point plots as follows: Longitude 105° 41.581’ and Latitude 39° 42.479’. A colleague used his GPS (NAD 27) and obtained Long. 105° 41.532’ (average of 3 readings) and Lat. 39° 42.479’. Wheeler’s readings, when converted to thousandths of a minute are Long. 105° 01.461’ and Lat. 39° 42.606’. I don’t know how to convert the discrepancy in longitude values to feet, but I suspect it is substantial. I had always assumed that the difference was simply due to inaccuracies in Wheeler’s observations and computations, but after reading this forum, I realize much more might be involved. Further comment would be much appreciated! Quick edit: I double checked Wheeler's longitude value for the Georgetown monument, which he gives in three different places. One of them has a typo, and of course that is the one I typed in my discussion above. The correct Wheeler longitude minutes should be 41, not 01. I found this link while researching. It has a great rundown of the names of it all and where it is. Great to see the post and interest. Here is a link to photos of the observatory pillars, I believe that they are in the correct location, but are probably reproductions just as the Salt Lake Meridian. This can be found approximately 100' northwesterly and inside the Temple Square Wall. Here is also a link to Salt Lake Northwest Base, which is an 1800's brick and concrete structure for geodetic measurements. While I was in this area, I also to the time to get to the Wheeler monument out at Kelton, Utah. This monument in question does look almost exactly like that monument out in the desert, except that it appears to be about 75% buried below the grade line. If you have any information on any of his monuments up in Montana, I would be very interested in trying for a recovery. The difference between Wheeler's coordinates and those given by your friend's GPS receiver arises from several causes, some of them perhaps more or less manageable with free software available from the NOAA/NGS website. We don't know enough about Wheeler's work to say what geographic datum his coordinates were based in. If that could be known, maybe a pretty reliable conversion from his datum to that of your friend's GPSr could be made, possibly with software available for download from NGS. One example is NADCON, used to convert between NAD27 and NAD83 coordinates. Once both sets of coordinates are in the NAD83 datum (not the same as WGS84, but so close as to make no practical difference), another program called INVERSE (DOS-based, also available from NGS) can be used to discover the bearing and length of the line between the two sets of coordinates. The error allowances for these programs are much smaller than that for the GPSr. There are folks here who know a great deal more about this than we do, and here's hoping they'll chime in. The Wheeler team did not install a monument in Salt Lake City, at least not through 1874. Instead, they used the Mormon observatory, located “about one hundred feet from the southeast corner” of Temple Square. ... Does this observatory still stand? ColoBill - Welcome, and thank you very much for your insights. I will see what I can find out about the Mormon observatory; I agree with CallawayMT that the base and meridian markers are reproductions since (from the pictures) they do look like they're made of the local sandstone and don't appear to be worn enough for the original markers' age. The sandstone here is terrible stuff for any enduring structures - the foundation trim of my house is made from it and it's a hassle. The monument I found does appear to be made of concrete, but I couldn't say for sure. It certainly isn't sandstone. It might be weathered granite, but I don't know enough about building materials to say with any certainty what it is. Hopefully the pictures in the original post are clear enough to give you some idea; if not, I can try to post the full-resolution pictures from my camera. I read that Wheeler did some work in Salt Lake City in 1879, toward the end of his expedition. It may be that this is one of those later ones. On edit: Looking at the pictures again, I think the monument may be some kind of stone with a bit of concrete poured on the top to secure the Stilwell memorial plaque. This one was found in Yellowstone. CallawayMT already found it behind me as well. I am sure it is in one of them projects. Just one of the factors that complicates the conversion of today's GPS coordinates to the coordinates of 100 years ago: in those days, longitude was reckoned from the axis of the transit telescope at Geeenwich observatory which was, of course, longitude 0. In the WGS84 system that our GPS receivers use, longitude 0 is some 100 meters east of the transit telescope axis, something like 5 seconds difference. So to a first approximation, 5 seconds should be added to all 19th century longitudes. In the days of Wheeler and Dean (who did the 1869 calculation at the Mormon observatory), they used the telegraph to get accurate time signals from Boston and San Fransisco, so they could have a pretty good value for longitude. Latitude doesn't rely on time, so they could get pretty good values for latitude, also. It is likely that most surveys in the Salt Lake area were tied to the position of the Mormon Observatory (the source of the Salt Lake principle meridian and base line), which was one of the reasons I tried to estimate the difference between the positions observed in the 1800''s with the current position in NAD83. They were also quite aware of the deviation of the vertical, and were able to correct for it to a degree, but probably not quite as accurately as today. In the late 19th century, the first transcontintal triangulation was completed, the "39th parallel arc", and for the first time, the east and west coasts could be tied into one national datum. It's even possible that the stone we've been discussing was placed as a secondary survey marker off of the transcontinental arc. However, all the calculations that I've done, using different assumptions about what the inscribed position might be, all result in from about 500 to 1500 meter differences. I'm beginning to think that the stone was moved, and was simply a convenient chunk of rock upon which to mount the memorial plaque. I found this link that gives a little more detail for what holo said about the shift at Greenwich. Everything gets messy if you look at the details. A Confluence chaser tried to understand the difference, with some pictures. ASTRO PARTY 621 VISITED THIS STATION.
" I can provide Wheeler's lat-long figures for these, if anyone is interested. (I have a personal copy of Wheeler's v. II, 1877, Astronomy and Hypsometry, which I found in a second-hand book store in Seattle -- it's falling apart, but is still a great reference!) It's too bad that we don't seem to have any record of any monuments that wheeler might have installed during 1875-79. At the Denver Public Library I will double check his other volumes to see if I can find any reference to later monuments." I would be interested in those coordinates. Here they are, as listed in Wheeler's table of "Geographical Positions" (v. II, p. 488-491). The reports contained in the text of Volume II are for "The Astronomical Determinations at Main Stations." These are the 19 stations I mentioned in previous postings (6 from Colorado, 13 from other states). I inadvertently omitted Cheyenne, WY, because it is written up in a different report. But I notice that in this table he lists additional sites (44 altogether), and for some (e.g., Battle Mountain, NV) he indicates in the Remarks column "Top astronomical monument," implying that monuments were emplaced at least at some of these sites, as well as at the "main stations." Under the title of the first section of the table is the following: "Transit instrument for chronometer error; zenith telescope for latitude (Talcott's method); telegraph time signals for difference of longitude." In the table and here, the sites are listed alphabetically by town name. "Main stations" are shown by an asterisk. The following group (p. 490) has, under the table name, the following: "Sextant and transit for time; sextant for latitude; telegraphic time signals for difference of longitude." There is a third section (p. 491), with six points listed. Under the title it reads: "Geographical positions by measurement from or by trigonometrical connection with main astronomical points." I can provide coordinates for these points if desired. The one in Santa Fe is right in the town square. I remember seeing it years ago. Thanks for the coordinates a few more will be welcomed. Do not know when I will get there to look but someday. I am working on those now. The other puts you in the Baha de California. I got them all in google earth now. I will work up the KMZ file. Shhh. That's the black helicopter base in Secret Kanab! Yep, 37 makes more sense! That's another typo in Wheeler's book -- no telling how many more there are. I have done some checking to see who has jurisdiction over these monuments. My goal is to arrange for some form of preservation of the sandstone monuments in Colorado, because they are deteriorating badly due to weathering. The engraved lettering is getting difficult to read, and the block at Julesburg has a crack in it. The one at Georgetown is in the best condition, and the one at Trinidad has lost almost all of the lettering. My first step was to contact the National Geodetic Survey, because next to the monument in Julesburg is a NGS “witness post” requesting observers not to disturb the nearby "Survey Marker." I have been in touch with the Colorado office of NGS, and as a result a similar witness post has been installed at the Trinidad site. However, otherwise they have not been much help. I then contacted the Office of History of the U.S. Army Corps of Engineers (because Wheeler’s survey was conducted by the Corps), and after some research they concluded that because the monuments are on private property the Corps no longer has any jurisdiction. Only if the monument is on military property would the Corps or other military entity have jurisdiction. Although the USGS emerged in 1879 as an outgrowth of the four major western surveys being conducted in the 1870s, my contacts with people in that agency indicate that the USGS has no interest in or jurisdiction over these monuments. Thus I conclude that, generally, private owners or communities are the only ones that have control. I have talked to some people knowledgeable in the preservation of historic stone works. There seem to be two schools of thought on the best approach, both of which involve keeping moisture out – one says to coat the surfaces with some chemical preservative, and the other says that this may exacerbate the problem; instead, according to this school, the best approach is to cover the upper surface with a simple shelter roof. I tend to favor the latter approach, but probably more opinions should be sought. Edit: Post #49 was supposed to be a quote, and #50 a comment in response. But I expect you all can figure it out!